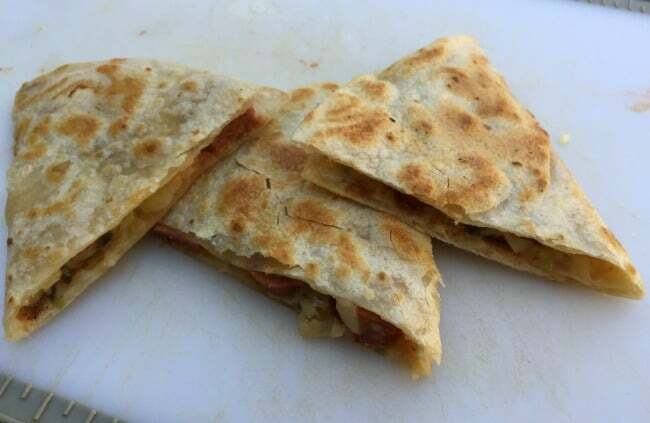 The idea for this skinny cheesy hot dog quesadilla was hatched as I was cleaning out the fridge around lunch time and discovered a couple of hot dogs lurking. Since quesadillas are one of my favorite things on earth to eat, I decided to use one of them to make a skinny cheesy hot dog quesadilla for lunch. Topped with a smattering of mustard, relish and ketchup, it turned out better than I’d hoped. I balanced things out by having a small spinach strawberry salad on the side. The points for this skinny cheesy hot dog quesadilla will vary considerably depending on the ingredients you use. You could definitely shave off a SmartPoint,or two, by choosing a smaller, or low carb, tortilla. I calculated mine at 7 SmartPoints. By using mostly mustard, with just a smattering of ketchup and relish, I was able to keep the condiment count to just 1 additional SmartPoint. Rounding things out with salad helped to keep both my tastebuds happy and my stomach satisfied for hours. This simple yet tasty recipe should please even the most picky palate. 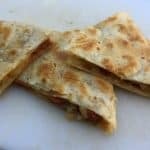 Simple and tasty with just 3 ingredients this skinny cheesy hot dog quesadilla comes together in minutes and should please even the most picky palates. condiments of your choice: mustard, relish, ketchup, salsa, hot sauce, bbq sauce, etc. Spray a nonstick skillet with cooking spray and heat it over medium-high heat. Put the tortilla in the skillet. Sprinkle one half of the tortilla with cheese. Arrange the hot dog slices on top of the cheese. Cook until the underside of the tortilla is golden brown and the cheese begins to melt. Fold the unfilled side of the tortilla over the filled side and press gently. Remove from the skillet and cut into 3 or 4 wedges. Serve with your favorite hot dog condiments.